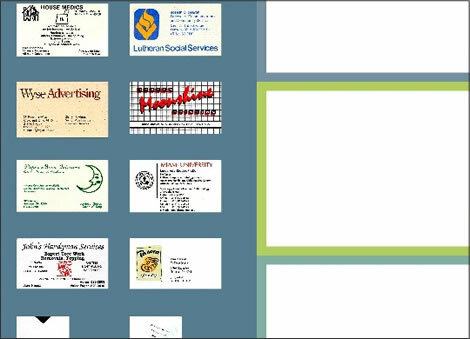 The Business Card Layout activity was created for the Graphic Design faculty to use during the lecture. The interface allows students to collaborate and view 20 business cards’ layouts, and sort them based on design quality. A “correct” feature re-sorts the cards based on the definitions provided by the faculty member in class. The activity can be reset and run again to test understanding of the topic. The interaction was made in Flash and uses an XML structure, which allows the faculty member to replace the cards as they see fit. This entry was posted in Interactive, learning activity and tagged business cards, fine arts, flash, graphic design, layout, xml by Britt Carr. Bookmark the permalink.